Herpes simplex virus type-1 (HSV-1) enters into cells via membrane fusion of the viral envelope with plasma or endosomal membranes mediated by viral glycoproteins. HSV-1 virions attach to cell surfaces by binding of viral glycoproteins gC, gD and gB to specific cellular receptors. Here we show that the human ocular and highly neurovirulent HSV-1 strain McKrae enters substantially more efficiently into cells via the gB-specific human paired immunoglobulin-like type-2 receptor-α (hPILR-α). Comparison of the predicted amino acid sequences between HSV-1(F) and McKrae strains indicates that amino acid changes within gB, gC, gH and gL may cause increased entry via the hPILR- α receptor. HSV-1 (McKrae) entered substantially more efficiently than viral strain F in Chinese hamster ovary (CHO) cells expressing hPIRL-α but not within CHO-human nectin-1, -(CHO-hNectin-1), CHO-human HVEM (CHO-hHVEM) or Vero cells. The McKrae genes encoding viral glycoproteins gB, gC, gD, gH, gL, gK and the membrane protein UL20 were sequenced and their predicted amino acid (aa) sequences were compared with virulent strains F, H129, and the attenuated laboratory strain KOS. 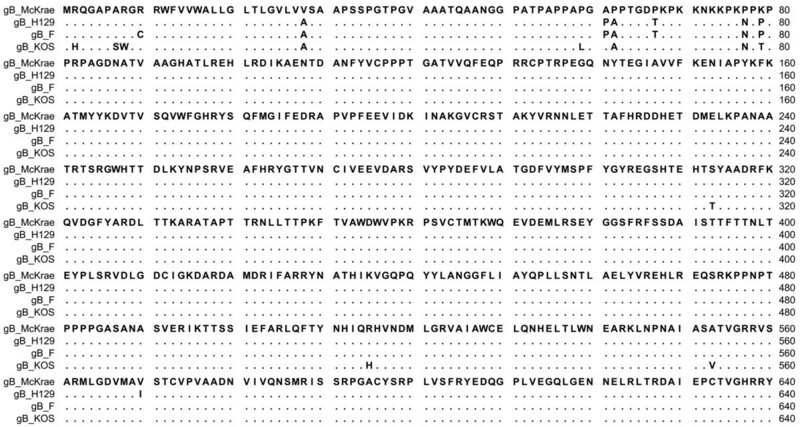 Most aa differences between McKrae and F were located at their gB amino termini known to bind with the PILRα receptor. These aa changes included a C10R change, also seen in the neurovirulent strain ANG, as well as redistribution and increase of proline residues. Comparison of gC aa sequences revealed multiple aa changes including an L132P change within the 129-247 aa region known to bind to heparan sulfate (HS) receptors. Two aa changes were located within the H1 domain of gH that binds gL. Multiple aa changes were located within the McKrae gL sequence, which were preserved in the H129 isolate, but differed for the F strain. Viral glycoproteins gD and gK and the membrane protein UL20 were conserved between McKrae and F strains. The results indicate that the observed entry phenotype of the McKrae strain is most likely due to a combination of increased binding to heparan sulfate receptors and enhanced virus entry via gB-mediated fusion of the viral envelope with plasma membranes. Herpes simplex type 1 (HSV-1), Herpes simplex type 2 (HSV-2) and Varicella-zoster virus (VZV) are human neurotropic viruses that belong to the Alphaherpesvirinaesubfamily and are a major cause of worldwide morbidity [1–4]. Neurovirulence, establishment of latency in sensory neurons and intermittent reactivation are some of the unique properties of these viruses [5, 6]. Reactivation of latent virus from trigeminal ganglia can lead to recurrent ocular infections and is a leading cause of blindness in developed countries [7, 8]. In very rare cases HSV-1 can spread spontaneously to the brain, causing life threatening herpes encephalitis . Herpes virus initiates infection by binding to heparan sulfate (HS) moieties on cell surfaces using viral glycoproteins gC and gB . Moreover, viral glycoprotein D (gD) binds to different cellular receptors including the herpesvirus entry mediator (HVEM, or HveA), nectin-1 (HveC), or 3-O-sulfated HS [10–12]. Apparently, gB can also bind to additional receptors including the paired immunoglobulin-like type 2 receptor alpha (PILRα), non-muscle myosin heavy chain IIA (NMHC-IIA), and myelin-associated glycoprotein (MAG) that function in virion attachment and virus entry [13–15]. HSV-1 enters into epithelial and neuronal cells via a pH-independent fusion of the viral envelope with plasma membranes, while it can enter into a wide range of non-neuronal cells via either pH-independent or pH-dependent endocytosis. Binding of gD and gB to their cognate receptors is thought to trigger sequential conformational changes in gH/gL and gB causing gB-mediated fusion of the viral envelope with cellular membranes during virus entry, as well as fusion among cellular membranes [16–18]. HSV-1 clinical isolates, such as the McKrae and H129 strains, are known to be highly virulent in rodents and rabbits in comparison to other laboratory strains such as KOS [19–21]. Several viral proteins and glycoproteins contribute to neurovirulence and latency in vivo, however their mode of action is not well elucidated [22–30]. HSV-1 gK is known to be involved in neurovirulence [30–34], and is a structural component of the virion particle functioning in virus entry into epithelial cells [35, 36], cytoplasmic virion envelopment, virion egress and virus-induced cell fusion [37–39]. Recently, we showed that that HSV-1 gK and UL20 physically bind to gB and gH and modulate gB-mediated membrane fusion [40, 41]. Also, we reported that gK is essential for virus spread in the cornea of mice, neuroinvasiveness and establishment of latency into ganglionic neurons . In this manuscript, we compared the relative efficiency of virus entry between HSV-1 McKrae and F strains and found that McKrae entered substantially more efficiently into Chinese hamster ovary (CHO) cells expressing the hPIRLα. We sequenced all viral genes encoding viral glycoproteins involved in entry and cell-to-cell fusion and identified aa differences between McKrae and F strains that may cause the observed enhanced entry of McKrae over other viral strains. Both McKrae and F viruses appeared to enter with similar efficiency into Vero and CHO cells expressing either nectin-1 or HVEM (Figure 1: A, C, D, respectively). In contrast, F entered into CHO cells expressing PILRα substantially less efficiently than McKrae (Figure 1: B). Comparison of McKrae, F, KOS and H129 gB aa sequences (Figure 2) revealed that most of the aa differences between the four strains were located within the N-terminal 80 aa of gB. Amino acid comparison of four strains revealed that KOS had a number of aa that differed from the other HSV-1 strains. McKrae gB had a unique aa (A28V) within its predicted signal sequence (Figure 2). Comparison of F and McKrae gB sequences showed the following aa changes: C10R, A28V, P61A, A62P, T67P, N77P, and P79K (Table 1). Comparison of HSV-1(F) and McKrae entry efficiencies. (A) Entry into Vero cells. (B) Entry into CHO-hPILRα. (C) Entry human CHO-nectin-1. (D) Entry into CHO-hHVEM (D). All cells were infected with HSV-1(F) or McKrae at an MOI of 1. At 12 h post-infection, the cells were stained with anti-ICP4 antibody and analyzed by flow cytometry to determine the percentage of infected cells. Alignment of the predicted glycoprotein B (gB) amino acid sequences specified by HSV-1 strains McKrae, H129, F and KOS. Amino acids that match the McKrae sequence are represented by dots. Amino acid changes that are different with respect to the HSV-1 McKrae strain are shown. The region of gB (aa 1-640), which contains aa substitutions is shown. Comparison of the aa sequence of gC of HSV-1 McKrae, F, KOS and H129 revealed that aa variations between the four strains were distributed throughout the molecule (Figure 3). Although McKrae and KOS were more similar to each other, McKrae differed from all three strains at aa positions 289 (A289D) and 299(F299L). Specifically, there were 20 nucleotide differences between gC of F and McKrae strains. Out of 20 nucleotide differences only 8 resulted in the aa changes V16L, Q75K, D116G, L132P, A289D, F299L, H306R, R421H (Table 2). Nucleotide comparison between gD of HSV-1 F and McKrae strain revealed no aa differences between the McKrae and F strains (data not shown). 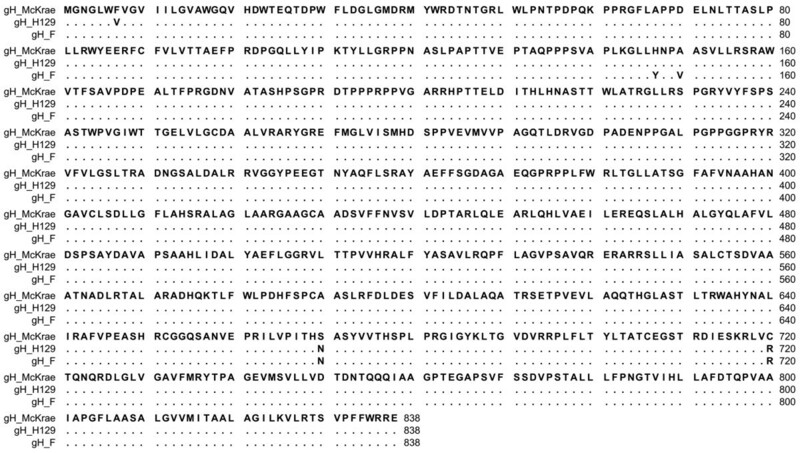 Comparison of the McKrae, F and H129 gH aa sequences revealed that these proteins were highly conserved (Figure 4). There were only three aa differences in the H1 domain of gH and two aa differences within the C terminal H3 domain of gH. There were two unique aa substitutions (S670N and C720R) in McKrae gH that were not present in either strain F or H129. Moreover, HSV-1(F) and McKrae strains differed by four aa in gH (Y147H, V150A, N670S, and R720C) (Table 3). Amino acid alignment of gL encoded by McKrae, F, H129 and KOS revealed a number of aa differences that were spread across the entire molecule (Figure 5). The aa sequence of strain McKrae was similar to strain H129 except at aa residues 171,181 and 212. Comparison between nucleotide sequence of gL of HSV-1 F and McKrae strain revealed 19 nucleotide differences, ten of which coded for different aa (S22P, K90R, V100G, N115D, P168L, G171R, P181S, P196S, L202S, A212T) (Table 4). Seven of these aa changes were conserved in the H129 strain (P22, R90, G100, D115, L168, S196, S202) (Table 4). F and McKrae gK sequences were absolutely conserved despite four nucleotide changes within their genes. Similarly, there were four nucleotide changes between the UL20 gene of HSV-1 F and McKrae strains without causing any aa changes. Alignment of the predicted glycoprotein C (gC) amino acid sequences specified by HSV-1 strains McKrae, H129, F and KOS. Amino acids that match the McKrae sequence are represented by dots. Amino acid changes that are different with respect to the HSV-1 McKrae strain are shown. 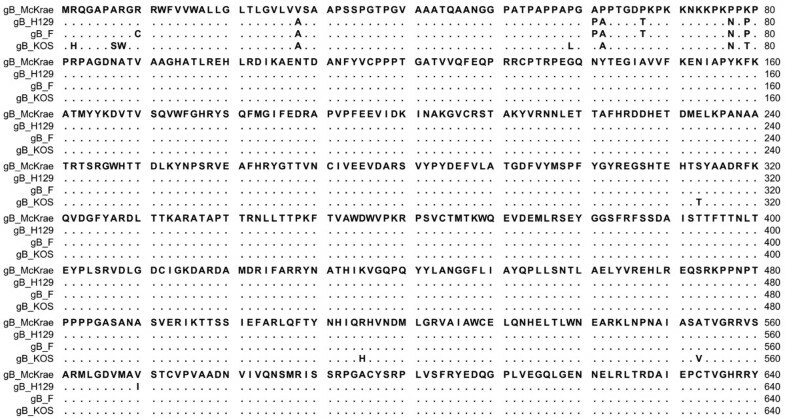 Alignment of the predicted glycoprotein H (gH) amino acid sequences specified by HSV-1 strains McKrae, H129 and F. Amino acids that match the McKrae sequence are represented by dots. Amino acid changes that are different with respect to the HSV-1 McKrae strain are shown. Alignment of the predicted glycoprotein L (gL) amino acid sequences specified by HSV-1 strains McKrae, H129, F and KOS. Amino acids that match the McKrae sequence are represented by dots. Amino acid changes that are different with respect to the HSV-1 McKrae strain are shown. HSV-1 utilizes multiple receptors to attach and enter into a variety of cells including neurons. Recently, it was shown that gB binds to cellular receptors that are required for gB-mediated membrane fusion during virus entry and virus-induced cell fusion. We show here that the HSV-1 McKrae strain utilizes the gB receptor PIRLα more efficienty than HSV-1(F). DNA sequencing of all viral glycoprotein genes involved in membrane fusion indicates that there are a number of aa differences between HSV-1(F) and McKrae in gB, gH and gL that may affect PIRLα- mediated virus entry. Initial entry experiments revealed that PIRL-α did not function as efficiently in facilitating virion entry in comparison to the gD receptors nectin-1 and HVEM when strains HSV-1(F) and KOS were used (not shown). Recently, we cloned the HSV-1(McKrae) strain as a bacterial articifical chromosome (bac) that has enabled us to rapidly produce mutant viruses, as we have previously done with HSV-1(F) bac [42, 43]. We have found that this viral strain efficiently enters into a variety of cells including CHO cells constitutively expressing PIRLα. PIRLα binds gB and membrane fusion can be affected by interactions of gB with viral glycoproteins gD, gH/gL and gK/UL20 [18, 40, 41]. Therefore, we compared the predicted aa sequences between F and McKrae strains and found a number of aa that could contribute to the observed increased efficiency of entry of McKrae over F and other strains. Of particular importance were aa changes between F and McKrae located within the amino terminus of gB, known to bind to PIRLα and gK [41, 44]. Specifically, gB binds to PIRLα via O-linked glycans located at aa positions 53 and 480 . However, gB binding to PIRLα is also dependent on the conformation of the amino terminus of gB, since aa insertions in gB could reduce this binding . Insertional mutagenesis has revealed that the structure and function of gB is not particularly flexible in tolerating aa insertions . The McKrae gB contains additional proline residues at aa positions 67 and 77, while other proline residues have been re-arranged. Specifically, the F gB has a proline at aa 61, which is an alanine for the McKrae strain, but the McKrae gB contains a proline at aa 62 instead of alanine. The structure of the amino terminus of gB is not known, although the x-ray structure of gB (aa 111-726) was obtained . The additional proline residues suggest that the amino terminus of gB assumes a conformation that may affect binding to PIRLα [44, 47–49]. In addition, this altered conformation of gB may affect interactions with gK, which binds to the amino terminus of gB and regulates gB-mediated membrane fusion . Interestingly, six aa changes seen in McKrae versus F gB were conserved in the gB specified by the neurovirulent strain ANG  suggesting that these aa may contribute to neurovirulence. Viral glycoproteins gD and gH have been shown to bind gB and modulate its ability to cause membrane fusion . Therefore, mutations within the extracellular portions of gD and gH, as well as gL may affect the ability of gB to utilize the PIRL-α receptor. In addition, since gH forms a functional heterodimer with gL , it is possible that the observed aa differences between McKrae and F within gH domain H1 may affect interaction with gL, known to bind exclusively to this domain . The carboxyl terminus of gH has been shown to be important for virus-induced cell fusion . Therefore, the observed aa changes N670S and R720C may alter virus entry kinetics. Multiple aa changes in gL between McKrae and F (S22P, K90R, V100G, N115D) are within the gL domain known to interact with gH and may affect gH/gL cell-surface expression, cell fusion and virus entry. Positively charged aa residues are known to be critical for interaction with negatively charged sulfate/carboxylate groups of the HS chain . Moreover, basic aa residues are known to be critical for HS-binding activity . Therefore, the gC Q75K and H306R aa changes in McKrae compared to F may cause increased HS binding. Previous studies have delineated the HS-binding domain that interacts with gC amino terminal residues to be located between aa 33 and 123 , and between 129 and 247 . Therefore amino acid changes in McKrae gC (aa 75, 116 and 132) may result in increased initial binding of McKrae gC. The PILR alpha gene is expressed on cells of the immune system (monocytes, dendritic cells, NK cells, B cells, macrophages, neutrophils, eosinophils, mast cells), as well as neurons [13, 56]. Moreover, HSV-1 enters into corneal epithelial cells (HCE) via the nectin1, HVEM and PILRα receptors . Additional experiments are needed to determine the biological and pathogenetic implications of increased utilization of the PIRLα receptor by the HSV-1(McKrae). The availability of the McKrae strain as a bacterial artificial chromosome will enable the rapid construction of mutant viruses that could be used to elucidate the role of each viral glycoprotein in PIRLα mediated virion entry. The clinical ocular isolate and neuroinvasive strain of HSV-1 (the parental wild-type), McKrae strain, was obtained from Dr. J. M. Hill (Louisiana State University Health Sciences Center, New Orleans, LA, USA). African green monkey kidney (Vero) cells were obtained from the American Type Culture Collection (Rockville, MD, USA) and grown and propagated in Dulbecco's modified Eagle Medium (DMEM) supplemented with 7% fetal bovine serum (FBS) and antibiotics. The HSV-1 McKrae strain was maintained as a low passage stock on Vero cells. CHO-neo cells and CHO-nectin 1 were a kind gift from Dr. Yasushi Kawaguchi, (The University of Tokyo, Tokyo, Japan) and were propagated in Ham's F12 medium supplemented with 10% fetal calf serum (FCS) and 250 μg G418/ml. The CHO-hPLIRα cells were obtained from Dr. Hishashi Arase, (Osaka University, Osaka Japan), were grown in Ham's F12 medium supplemented with 10% fetal calf serum (FCS) and puromycin, 1 ug/ml. The human CHO-HVEM was created in our laboratory using PiggyBac Transposon system (System Biosciences). HVEM gene was cloned into PB514BL-1 PiggyBac Dual Promoter Vector and CHO cells expressing HVEM were selected using puromycin, 12 ug/ml. All cells were cultured in non-selective medium prior to use in infectivity assays. Viral DNA was isolated from infected Vero cells as described earlier for tissue samples . Briefly, confluent monolayers of Vero cells were infected at a multiplicity of infection of 2 and harvested by scraping at 24 hour post-infection. Cell pellets were rinsed with PBS and viral DNA was extracted using the DNAeasy Blood and Tissue Kit according to manufacturer's instruction (Qiagen, Valencia, CA, USA). Purified McKrae DNA and Fail Safe DNA polymerase (Epicentre Biotechnologies, Madison, WI) were used for PCR. Due to the high GC content of the genomic DNA, PCR was performed using a series of primers which generated overlapping products encompassing the entire gene to be sequenced. PCR products were column-purified (Zymo Research Corp., Orange, CA) and sequencing reactions were prepared using the Big Dye Terminator v3.1 Cycle sequencing Kit (Life Technologies). DNA sequencing was performed in both directions by a primer walking strategy for each gene using an automated DNA sequencer (3130 Genetic Analyzer, Applied Biosystems). The list of all synthetic oligo-nucleotides used for amplification of the McKrae genes and sequencing is shown in the Additional file 1, Table 1. The Sequencher (4.10.1) software package was used to assemble the overlapping fragments using default parameters. Sequence assembly was performed using the HSV-1 (F) strain as the reference sequence (Gene Bank:GU734771.1). Nucleotide sequences of the following McKrae genes: gB, gC, gD, gH, gL, gK and UL20 were submitted to GenBank (accession numbers: JQ320080.1, JQ359758.1, JQ320083.1, JQ320081.1, JQ359759.1, JQ320082.1, JQ320079.1). The CLC sequence Viewer version 6 software was used to align the aa sequences of H129 (GenBank: GU734772.1), F (GenBank: GU734771.1) and KOS strain (gB:AAG34116.1; gC: AAA45779.1; gL: AAA99790.1) against the derived McKrae sequences. Alignment was performed using the default parameters of the Clustal W alignment program (CLC sequence viewer software). To determine nucleotide and aa sequence variation between the McKrae and F strains, the sequences were aligned by the MegAlign program in the DNASTAR software package (Lasergene). The differences in nucleotides and aa in the coding region of each sequenced gene were tabulated in Tables 1, 2, 3 and 4. Confluent monolayers of CHO-neo, CHO-hHVEM, CHO-hPILRα, CHO-human nectin-1 and Vero cells were infected with HSV-1 strains (McKrae and F) at a multiplicity of infection of 1 for 1 hr at 34°C. The virus inoculum was subsequently removed, and the cultures were shifted to 37°C. Twelve hours post-infection (hpi), the cells were fixed and stained with anti-ICP4 antibody (Virusys, Inc., Taneytown, MD) and Alexa Fluor 647 goat anti-mouse IgG1(Life Technologies, Grand Island, NY). The relative efficiency of virus entry was calculated by flow cytometry as the percentage of cells expressing ICP4 normalized to the CHO-neo entry values. Mean values and standard deviations of three independent experiments were calculated. This work was supported by grant AI43000 from the National Institute of Allergy and Infectious Diseases to K.G.K. We acknowledge financial support by the LSU School of Veterinary Medicine to BIOMMED. DNA sequencing was performed by the BIOMMED Core Facility GeneLab. SC was primarily responsible for virus entry experiments, sequence assembly of all genes and interpretation of amino acid differences. MN performed DNA sequencing reactions and assisted in virus entry experiments and gene sequence assembly. JW was responsible for designing the flow cytometry experiments. VC and KK were responsible for overall interpretation of the results and manuscript preparation. All authors read and approved the final manuscript.